Not bad for a Monday! Alright I did make the Quinoa Spinach Cakes and prepped the salad fixings yesterday but this was such a good dinner for the start of the week. The Golden Semolina Quinoa Spinach Cakes recipe can be found on the Food and Wine site. They were a little time consuming and I was hesitant to fry them but we don't eat that much fried food. Delicious. The frying was a plus. I was not sure about the recipe as I was making it but I was quite pleasantly surprised. Now the salad was also a hit. The Leon Salad. A take on a salad from La Scala in LA. The recipe can be found on the Saveur site. The marinated salami and provolone, well I should not even have to tell you. What a great addition to the salad. I added a green I had not used, nor seen in the store before yesterday - Baby Kale! Who knew? The recipe called for mint and I was not happy with the selection at the store so I grabbed the Baby Kale. I liked the texture and the taste paired with the romaine, radicchio and parsley. My blog was featured on Briciole, Pasta Please: il riepilogo/the roundup. 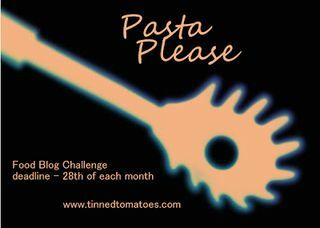 Check it out there are some amazing pasta dishes. And I have planted this summer's deck garden. 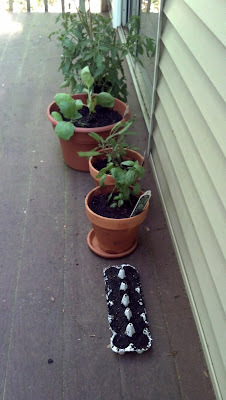 I got the last white eggplant at the garden center! I am sure my Dad is smiling!